This page contains brief descriptions of (some of) my research projects and (sometimes) links to longer blurbs with more detail. You can also find some links to the products of this research. We propose an investigation of the philosophical consequences of 'quantizing' gravity--of theories of quantum spacetime. Because such theories, like heliocentrism or relativity before them, challenge the most fundamental ingredients of physical reality--space and time--their development will require philosophical rethinking of basic concepts. In turn, they promise to revolutionize humanity's understanding of its relation to the world. Especially, quantum gravity's radical suggestion that space and time as we know them are absent from fundamental reality obliterates traditional conceptions of material existence, of laws of nature, and of causality. This project will analyze the implications. Conversely, the proposed research also informs the foundations of quantum gravity. From Copernicus, to Newton, Einstein, and Bell, scientific revolutions centrally trade on broadly 'philosophical' work; we expect quantum gravity to be no different. Thus, the second major thrust is to identify points on which philosophical clarification is needed for the scientific project, and to deliver it. Even so, philosophers have been slow to investigate, so we propose to continue and amplify the work we have done developing the subject and providing training and opportunities for others to pick up the challenge. The core of the project would be a 3-year research group comprised of the PIs (Huggett and Wüthrich) and their students, and of pre- and post-doctoral fellows. In addition to publishing their research in the area, the group will hold a summer school and a conference, edit volumes of papers, hold an annual essay competition, produce video lectures and talks, and develop a website to disseminate results. By their contributions the group would advance our understanding of the philosophical consequences of quantum gravity; the scholarly community building would help create the dialogue between physics and philosophy necessary to articulate fully those consequences for science and humanity. Our proposed research focuses on the foundations of string theory, on the foundations of approaches that have grown out of general relativity such as loop quantum gravity and causal set theory, and on their metaphysical implications. More specifically, we will investigate, e.g., whether space and time are emergent in 'meta string theory'; what implications QG has for our conception of the cosmos; how a functional analysis of spacetime may be sufficient to show how relativistic spacetimes can emerge from fundamental, non-spatiotemporal structures; whether, and to what extent, time travel is permitted in various approaches, and how this fits with the predictions of general relativity. Additional projects will study the broader ramifications of QG for philosophy: especially, how to rethink such metaphysical concepts as possibility and actuality in a world without spacetime. As a predecessor to our Templeton project, Nick Huggett and I worked on a large new research project funded (inter alia) by the American Council of Learned Societies on the emergence of spacetime from fundamental, non-spatio-temporal structures as suggested by many approaches in quantum gravity. We are currently in the final stages of completing a book under contract with Oxford University Press, Out of Nowhere: The Emergence of Spacetime in Quantum Theories of Gravity, which should appear in late 2016. Raiders of the lost spacetime (forthcoming, link to preprint). Emergent spacetime and empirical (in)coherence (2013, with Nick Huggett, link to preprint). The emergence of spacetime in quantum theories of gravity (2013, editorial, with Nick Huggett, link to preprint). Time in quantum gravity (2013, with Nick Huggett and Tiziana Vistarini, link to preprint). A la recherche de l'espace-temps perdu (2013, link to preprint). Die allgemeine Relativitätstheorie als Ausgangspunkt einer Quantentheorie der Gravitation (2012, link to preprint). In 2008, I have started a research project on the resurgence of presentism in the philosophy of time. The primary goal of this project is to collect and analyze arguments for presentism based on results from physics. Currently, I am not actively working on this, but I plan to return to the problem in due course. The first product of this project (paper (9) in my publication list) was published in a collection edited by Vesselin Petkov. You can find a preprint here. A second paper (paper (12), link to preprint) explicates how the position of presentism can be demarcated in a metaphysically substantive way without collapsing into eternalism. A third paper (paper (19), link to preprint) discusses in broader scope how presentism may or may not be reconcilable with contemporary physics. The paper concludes that either our best physics rules out a presentist metaphysics, or what is left of presentism does not answer to the original presentist intuitions. Recent years have seen a growing consensus in the philosophical community that the grandfather paradox and similar logical puzzles do not preclude the possibility of time travel scenarios that utilize spacetimes containing closed timelike curves. At the same time, physicists, who for half a century acknowledged that the general theory of relativity is compatible with such spacetimes, have intensively studied the question whether the operation of a time machine would be admissible in the context of general relativity theory or theories that attempt to combine general relativity and quantum mechanics. A time machine is a device which brings about closed timelike curves--and thus enables time travel--where none would have existed otherwise. The character of this project makes it inevitable that its content is of a rather technical nature. The purpose of this project, among others, is to convince philosophers that they should nevertheless be interested in this literature because the topic leads to a number of interesting foundational issues in classical and quantum theories of gravity. Furthermore, philosophers can contribute to the topic by clarifying what it means for a device to count as a time machine, by relating the debate to other concerns such as the fate of determinism in general relativity theory, and by eliminating a number of confusions regarding the status of the paradoxes of time travel. Part of this is a joint project with John Earman (Pittsburgh, History and Philosophy of Science) and Chris Smeenk (University of Western Ontario, Philosophy). Chris and I have recently started to systematically study some of the implications of our earlier research. In particular, we are currently investigating the what it implies for the issue of determinism in general relativity and for what it means for a spacetime to be 'physically possible'. Although it appeared much later than some of the other papers, the original paper of this project is the joint article by all three of us which finally appeared in Synthese in 2009. Earman and I have written an entry for the Stanford Encyclopedia of Philosophy on this issue, see here. I have also composed an article for a collection in German, see here. Chris Smeenk and I have a paper on this in The Oxford Handbook of Time, edited by Craig Callender, Oxford University Press, 2011. For a preprint, go here. This related project is a collaboration with Hajnal Andréka and István Németi (Rényi Institute of Mathematics, Budapest), two Hungarian logicians interested in the foundations of general relativity. We investigate rotating black holes and other generally relativistic spacetimes where rotation of matter might induce closed timelike curves, thus allowing for a 'time traveller' who might take advantage of this spacetime structure. Interestingly, some kind of 'counter-rotational phenomenon' occurs here in the following sense. If a potential time traveller wants to use a Kerr-Newman black hole for travelling into her past, she will have to orbit along the closed timelike curve in the direction opposite to that of the rotation of the black hole. We analyze whether this phenomenon occurs generically in spacetimes with closed timelike curves. The first paper arising from this collaboration has been published in General Relativity and Gravitation, see here. We have started working on a second paper, to be made available in due course. Although I have worked on other projects in the past, and will again at some point in the future, I do not expect to have any time to work on them during the run of our Templeton project from 2015 to 2018. Having said that, I am still working on The mistery of the missing socks, of course. This is my research group, and it has its own website. 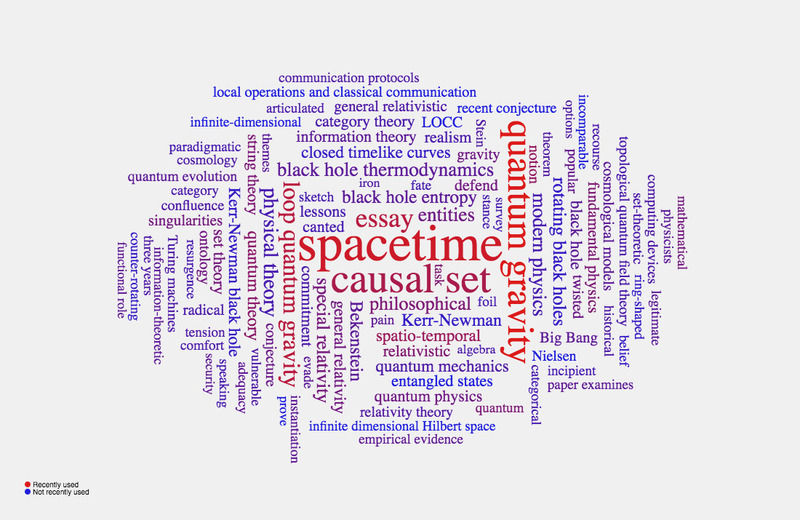 Beyond Spacetime is the blog on all things philosophy of quantum gravity run by Nick Huggett and me. The Beyond Spacetime franchise also has a YouTube channel where we upload videos of talks and lectures on the philosophy of quantum gravity. I have a profile on academia.edu, but I'm afraid I don't keep it quite up-to-date. I also have a profile on Research Gate, which is, however, even less up-to-date. Content: © Christian Wüthrich (last modified on 2 August 2018). Design: © 2008 by Free CSS Templates.